The Secret Service has stepped up security at the White House and launched a “comprehensive review” of procedures there after two attempted breaches in 24 hours. The more serious incident saw a man wielding a knife enter the building on September 19, prompting a partial evacuation. President Barack Obama was not present at the time of the incident. The following day, another man drove up to a security gate. Both men have since been arrested. President Barack Obama said he still had “full confidence” in the Secret Service, which is tasked with protecting senior American officials and visiting leaders. The man involved in latest incident, Omar Gonzalez, was only stopped after entering the North Portico doors, the Secret Service said. 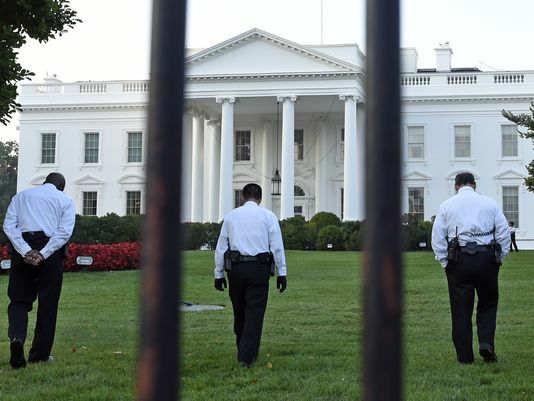 Video footage showed the intruder running across a White House lawn after scaling a fence. He was later found to be carrying a 3.5 inch folding knife. “Although last night the officers showed tremendous restraint and discipline in dealing with this subject, the location of Gonzalez’s arrest is not acceptable,” the Secret Service said in a statement. “Every day the Secret Service is challenged to ensure security at the White House complex while still allowing public accessibility to a national historical site,” it added. The president and his daughters had just left the White House by helicopter before Omar Gonzalez entered. The man was later taken to a Washington hospital after complaining of chest pains, officials said. An apparently unrelated incident on September 20 saw a man drive up to a vehicle gate in the complex and refuse to leave. Secret Service agents shut down nearby streets and searched the vehicle for explosives. Officials said Saturday’s incident was an “everyday occurrence”. The review of security was initiated by director Julia Pierson, who also ordered “the immediate enhancement of officer patrols and surveillance capabilities” around the White House. A White House spokesman said President Barack Obama expected the review to be conducted “with the same professionalism and commitment to duty that we and the American people expect from the US Secret Service”.